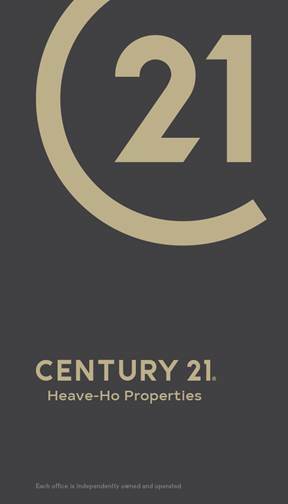 It is through our Core Values and the positive ethos of CENTURY 21 Heave-Ho Properties, that we accomplish our goals and achieve our mission. All persons associated with CENTURY 21 Heave-Ho Properties understand the need for these Core Values, they embrace and embody them. These Core Values are engaging, inspiring and the driving force for our daily activities. Dedicated Professional Service. The team at CENTURY 21 Heave-Ho Properties prides itself in providing a service that is professional, empathetic and responsive. We go above and beyond to ensure all our customers enjoy positive experiences throughout their engagement with the Company. Results Oriented. The team at CENTURY 21 Heave-Ho Properties is ambitious, career focused and goal oriented. We take the initiative when working with our customers to ensure they get the best possible results. Embrace Change & Drive Innovation. We expect change and embrace it. Our team sets new standards of excellence within the real estate industry and it is always developing and implementing new and innovative ways to provide superior service. Committed to Learning & Self Actualization. Our team is committed to both personal and professional growth. We know that part of being able to deliver exceptional service is through regular training and education. We constantly re-invest in ourselves by taking advantage of continuing education. We stay knowledgeable of the changes in real estate, so that we can pass the benefits on to our customers. Honest & Open Relationships through Communication. We maintain integrity in everything we do. We believe that when we are honest and open with others, we can build stronger relationships. This allows us to achieve greater success for our customers and ourselves. We are empathetic, loyal and respectful. We genuinely care about others. Pride though Quality Work. We take pride in what we do and maintain consistency through our delivery of thorough and high quality work. We take responsibility for producing only the best, as we try always to exceed our own high standards. Support Positive Team Work. We know that the best ideas and decisions are created through a positive team environment. The staff and sales team work together to address issues and overcome obstacles. We help everyone associated with CENTURY 21 Heave-Ho Properties to excel. We care and support each other and we are always willing to lend a helping hand. Passionate & Determined. We are passionate about our business and what we represent. We are determined to meet our goals and objectives because we love what we do. We maintain positive and optimistic attitudes so we can inspire others to do the same. Corporate Citizenship. We, as a Company, and as individuals working within CENTURY 21 Heave-Ho Properties, are responsible corporate citizens. We strive for success so the wider community thrives. We conduct our business in a sustainable manner for our employees and shareholders as well as the wider society and environment.